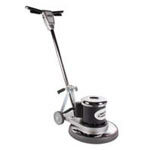 With a 13" deck, 200 RPM of muscle and a weight of only 40 pounds, the NaceCare low speed floor buffing cleaning machine is compact enough to handle just about any job, anywhere. It also has a profile height of only 7.5", allowing it to go places no other machine can. The handy solution tank thats included turns this economical machine into a portable cleaning system that easily folds for storage and transport.